Buy a woven wrap - new or secondhand? When setting out to buy your first woven wrap, you might want to consider whether to buy your wrap from new or secondhand. We'll here look at the pros and cons for the two options. N.B. : Please notice that this guide concerns woven wrap. If you want to buy a strechy wrap you can't use this guide. However if you want to buy a ring sling, please read on, as the same goes for ring slings as for woven wraps. A woven wrap is best when it's turns soft and moldable. However far from all wraps are soft and moldable from the very beginning. In fact most woven wraps will demand some degree of use to become the best version of themselves. It can be compared to a pair of jeans or a pair of leather shoes, which also need to be used a bit to fit perfectly. If you consider buying a specific woven wrap, you can search for it on Wraptrack to see how much breaking in it needs. Use the search field to find the wrap and chose 'see rating'. 2. The selection of woven wraps is larger when buying secondhand. Many woven wraps, especially the more expensive ones, are only in small batches. Also they often sell out quickly. Thus many woven wraps simply can't be found from new. On the other hand on the secondhand market there's wide selection of different wraps. However, there's a lot of great wraps to buy from new, and when buying from new, you can often expect to chose between different sizes. You might have a right of withdrawal if you change your mind. It's easier to complaint if receiving a flawed wrap. You can usually chose between different sizes. The previous owner will probably have broken in the wrap for you. You'll usually pay less for your wrap. There's a large selection of brands, patterns and colours. You have to break in the wrap yourself. You'll probably pay more for your woven wrap. There's a smaller selection of brands, patterns and colours. You have no right of withdrawal if you change your mind. The complaint process can be difficult if recieving a wrap with flaws. It can be hard to find the wrap you want in exactly the size you want. 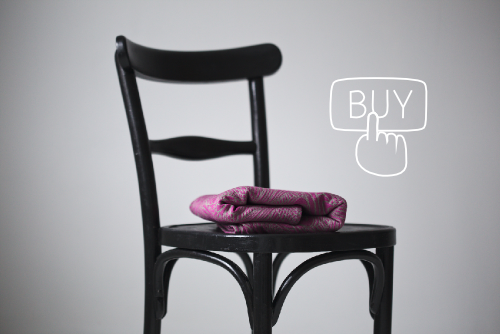 If you want to buy a woven wrap used you can take a look at Wraptrack's market. If you want to buy a woven wrap from new you can take a look at Wraptrack's list of babywearing shops.